For those of you who were following or reading my blog CyberReno's WELCOME! For all new readers - WELCOME too! This new blog has been in the works for over a month now. With all the other things I've been working on though, it's taken plenty of time to get up and running. But I've been dying for you all to see what I made ALL BY MYSELF! CyberReno's (my former blog home) began as a family blog, one that was short-lived. We quickly decided to make another private family blog. 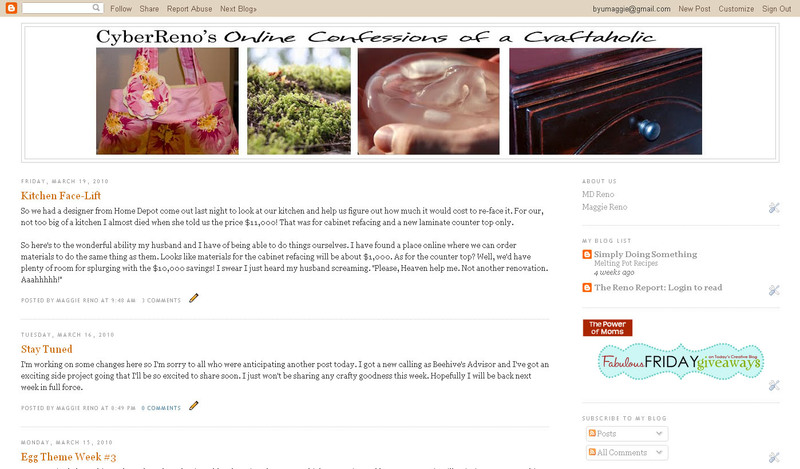 So that blog turned into a way to share all my crafting, sewing and other projects with the world. BUT I just didn't feel at home there. The name wasn't quite right and the design was just not cute enough. Thus, a change was needed. So here we are, over 2 years since I began that blog, starting afresh! Maggie Muggins Designs came about easily. I wanted something cute, something me, and something that said what this blog is all about. 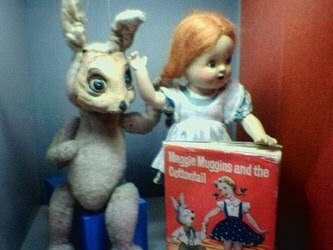 Growing up I was Maggie Muggins at my house. It was a little red-headed girl in a book, radio show, and TV show from my Mom's childhood. (In case you didn't know, I'm a red-head!) Only later in life did I realize it also happened to be the name of choice for several people's canines. Oh well. I love the books too much to stop now. The Designs part really says the rest. Crafting, sewing, decorating my home, and all the rest are all design to me. Aside from the new name and face let me point out a few things to you. Across the top there's now a links bar so you can see posts according to their labels. I'm still working out kinks there - so things may change in the next little bit. I've got a new button on the right for those of you that want to share this blog on yours. You can copy the html code on the right and paste it onto your blog. I've also added a Google search bar for you to be able to find practically whatever you want to on the blog. Lastly, I've set up a RSS feed in feed burner. If you want to read or follow my blog you can sign up on the right. The design of this blog took a lot of hard work. I redid the header probably 10 times. I changed the size at least 3. Getting the perfect look takes time, energy, Photoshop, and the ability to search the wonderful world-wide-web. But knowing that I saved myself plenty of money by designing this myself is worth all of that and then some! 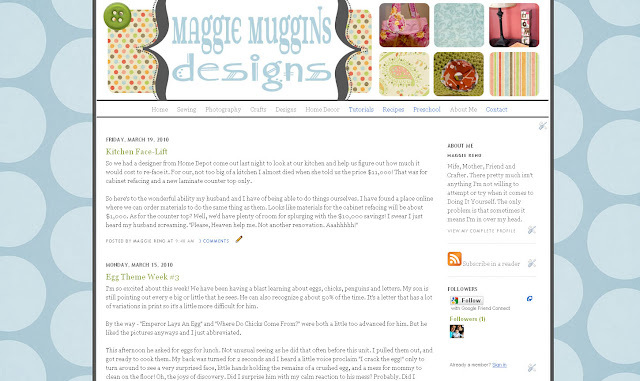 So I present to you Maggie Muggins Designs my new blog. Designed by me! I love it, and I hope you do to! I do love it! The colors are awesome together and the header is very cute too. I can't wait to make that spinach dip you posted. YUM!